When discussing the uniform of the Union Army it is important to understand how the Army was organized. Insignia and military titles represents various roles within the military organization. 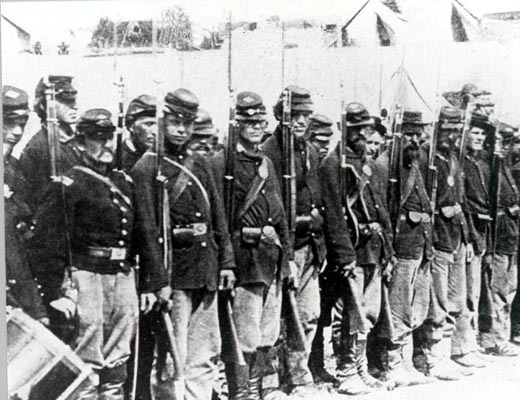 On May 4, 1861 the United States War Department issued General Orders Number 15, which outlined the basic organization of the volunteer force. The organizational plan followed the outline of a typical prewar Regular Army infantry regiment with a few exceptions. In the prewar Regular Army, which was distributed in posts or garrisons, chaplains and the medical staff were assigned to the posts and not the units in them. It should also be mentioned that the Regular Army experimented with a new three battalion organization for certain of the newly authorized infantry regiments (11th-19th). The commissioned officers were to be appointed by the governor of the state in which the regiment was raised and the noncommissioned officers either by the captain or if the unit was part of a regiment by the colonel on the recommendation of the captain. Cavalry regiments were similar but they had a company quartermaster sergeant, 2 buglers in place of musicians, 2 farriers and a saddler with between 56 and 72 privates. The cavalry regiment staff was similar except the band was allowed only 16 musicians. A major different between infantry and cavalry was that cavalry was allowed up to twelve companies to a regiment. The cavalry tables of organization were altered several times during the war. Additional officers (majors and second lieutenants were also added by an 1862 reorganization. Higher levels of organizations included brigades, which were to be commanded by a brigadier general, and include a staff consisting of a aide-de-camp (lieutenant), assistant adjutant general (captain), surgeon, assistant quartermaster (captain) and a commissary of subsistence (captain). A division staff included one major general, two aides-de-camp (captains or lieutenants) one assistant adjutant general (major). An army corps staff was established by General Orders No. 91 of July 29, 1862. It consisted of a major general assisted by three aides-de-camp (a major and two captains), assistant adjutant general (lieutenant colonel), quartermaster (lieutenant colonel), commissary of subsistence (lieutenant colonel), and assistant inspector general (lieutenant colonel). This plan was a basic outline and there were many alterations and exceptions made during the war. It was not unusual for colonels to command brigades and brigadier generals to command divisions. Aides-de-camp were selected among the company officers and could be returned at the pleasure of the senior officer. Another area of change concerned regiment bands. The large number of bandsmen allowed each regiment added up to a huge expense for the government and added little to the fighting ability of the unit. In October 1861 it was decided that no additional regimental bands would be mustered. Units would still muster with two bandsmen per company and a principal musician. On July 17, 1862 General Orders Number 91 was issued and abolished regimental bands entirely. The Orders provided that bandsmen were to be discharged or transferred within 30 days. It organized brigade bands of 16 musicians plus a band leader.